dear friends and family. welcome! and a few things. 1) we are so excited to be welcoming another little human into our world. although round 2 is vastly different from round 1, as you can guess, we love the prospect of a little girl to open our worlds, minds and eyes. 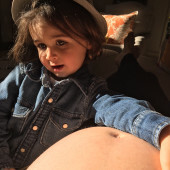 2) every day, elliott asks me to "open this" (pull up my shirt to show my belly), then kisses, blows raspberries and hugs my growing belly, ending with a "hiiiii, baaabbbyyy!" 3) we need nothing! REALLY! 4) but if you're looking to give a little something, the most helpful thing as we bring no. 2 into our home and lives is the generosity of time. things such as: (i) cooking us a meal, (ii) taking the baby and or elliott for a walk so we can clean, nap, do other things, or (iii) picking up a few items if you happen to be stopping for yourself at costco or trader joe's or the like. 5) we simply put this registry together for those of you who would like to send a little something because you can't offer your time. 6) we live in a small house, live fairly simply, and have lots of leftovers/hand-me-downs from elliott and others. 7) but to the extent you wish to splurge on a little something for our family, please use this as a guide. it's been heavily curated and mulled over. i know there are some splurges on it, but we'd rather have one item of excellent quality than three of another. we hope you understand and can't wait to see you have introduce you to our little girl.